Developed through a collaboration between the University of Vienna and the European Molecular Biology Laboratory (EMBL), SweetBac™ is the world’s first baculovirus that produces humanized glycosylation patterns on recombinantly expressed proteins. Recombinant production of therapeutically active proteins has become a central focus of contemporary life science research. These proteins are often produced in mammalian cells, in order to obtain products with post-translational modifications similar to their natural counterparts. However, in cases where a fast and flexible system for recombinant production of proteins is needed, the use of mammalian cells is limited. The baculoviral insect cell system has proven to be a powerful alternative for the expression of a wide range of recombinant proteins in short time frames. 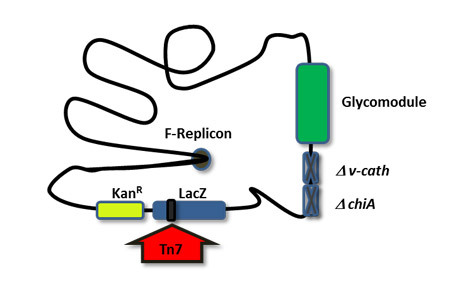 The major drawback of baculoviral systems lies in the inability to perform mammalian-like glycosylation required for the production of therapeutic glycoproteins. SweetBac™ provides unique advantages over existing baculovirus expression systems for i) production of targets for drug discovery and assay development ii) antibody development against membrane proteins like GPCRs and ion channels, and iii) manufacturing of biologics in insect cells with humanized glycosylation patterns. SweetBac™ transfer vectors are fully synthetic, comprising only functional DNA, and as a result are small and easy to handle. The SweetBac™ baculovirus genome is under continuous development to remove harmful/non-essential genes (e.g. v-cath and chiA) and DNA recombination hotspots, and contains an integrated fluorescent protein expression cassette to allow for easy monitoring of virus titer. SweetBac™ Baculoviral DNA. SweetBac™ is a MultiBac™ derived baculovirus expression system comprising a viral backbone with stably integrated N-acetylglucosaminyltransferase and β1,4-galactosyltransferase enzymes. Click here to download Palmberger et al 2013. Bioengineered. Click here to download Palmberger et al 2012. PLOS ONE.